As part of Energy Day’s year-round initiative to engage students in energy and STEM education, Consumer Energy Education Foundation (CEEF), Consumer Energy Alliance (CEA), and our Energy Day partners are excited to host the 9th Annual Energy Day Academic Program (EDAP). 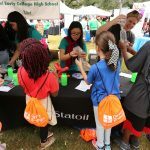 The Energy Day Academic Program helps to amplify existing academic competitions and events through a series of unique, citywide, STEM- and energy-related competitions aimed to motivate, challenge, and inspire young minds to seek careers in science and technology. Winners from each competition receive an award and recognition at Energy Day. To date, we have awarded over $130,000 in monetary prizes to both educators and students. If you won an award through the 2018 Energy Day Academic Program, please email Paige Barnes for more information about obtaining your gift card. If you’re an EDAP winner and would like to be featured on our website and in our monthly newsletter, please fill out this short survey and email Paige.